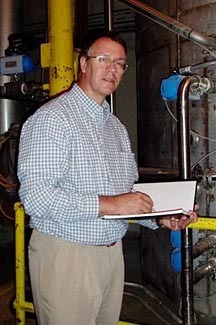 Clark Dale is the President and CEO of Bio-Process Innovation, a bio-tech R&D company that develops and licenses technologies for the industrial processing of biological materials in the production of high value bio-based fuels, products, chemicals, & commodities. His key problem solving skills are food processing, chemical engineering, bio-chemical engineering, and he’s worked on a couple of projects with IdeaConnection. What was it that attracted you to take part? Just the basic concept. I kind of think a lot of innovation comes from applying a certain set of skill sets, maybe just slightly different problems that are outside of your normal working environment, so it just seemed interesting to me. What have you been involved in to date with IdeaConnection? I worked on one project that had to do with fruit preservation. Then I also have recommended one guy for a job that they were advertising on IdeaConnection and so it turned out that he did get the job. So that was a success. What was your input to the fruit preservation challenge? My input was more scientific, because it did sort of draw fairly heavily on my background. I do have some sort of food processing, food science background so it was just a little bit of searching and then my own basic ideas. My input side was the science; some ideas of what might work for this particular project. How do you feel about working on a contingency basis? I'm reasonably comfortable with that. In my company we do a fair number of research projects, contract research for a number of companies and generally we want 50% of our fees up front and then 50% when they get the final report. So that if they're not happy with the final report they can ask us to redo it or something like that. So that's the way we do things here, so having it all contingency at the end is a little bit rear weighted. It might be nicer to have something up front for your effort. Did you enjoy the experience of working on a virtual team? Yes, I thought it was very nice. It's kind of interesting to have different people's ideas and inputs. The challenge I worked on we got off on a wrong tangent because the problem wasn't really very well stated, but eventually that got sorted out. Did you get a chance to have a dialogue with the Seeker once the team had been formed to hone in on exactly what was required, and to maybe redefine the problem statement? Right, that's what happened, but by then we had already spent a little bit of time and effort going down the wrong path before we had that clarification with the Seeker. But it all worked well having the clarification. What was the team dynamic like? I thought it worked quite well. You know a little bit like you and I right now that we had these Skype group meetings and so it was interesting meeting these other people and hearing their ideas and seeing their skill set. I thought it was very nice. Was everyone in concert from the beginning? Or were there differences that you had to iron out? I think basically, once we understood what they wanted then we came out working together, and had a pretty good idea of one good solution. Obviously you're busy; you run a company. Are the challenges something you would consider taking part in again? Yes, very certainly. I look at these things and think about them and if I feel like my expertise would be good for one of these things I’ll apply. So yes, I am quite interested and I'll definitely do more.